A Twitter user Aakash Shah alerted the Mumbai Police on the platform saying that he received such a call offering him Rs 25 lakhs. The Mumbai Police Twitter handle responded, asking Aakash not to share any sensitive details over a call and to report to the nearest police station. Please do not share any sensitive details over a call and visit the nearest police station for further support. We dialled the number (+923088556439) from which Aakash Shah received the WhatsApp message. A man who answered the call and identified himself as Ahmed Raza said that this was his residence number in Multan, Pakistan and he had nothing to do with any lottery business. 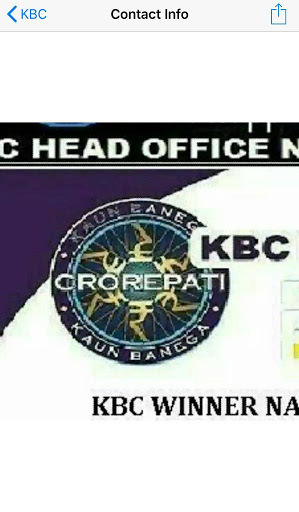 But when we looked at the display picture of the number on WhatsApp, we found an image of KBC. Raza failed to explain the origin of the image, hastily adding that someone could be misusing his number. A online mobile tracker software traces the number to Islamabad and the operator as Mobilink, one of Pakistan’s leading telecom operators. 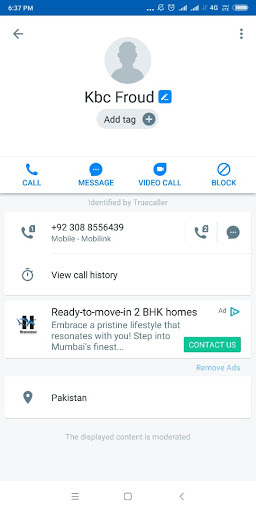 We also checked for the number on Truecaller and found it tagged as ‘Kbc froud’. This suggests that users who have received calls earlier from the number have tagged it as fraud. 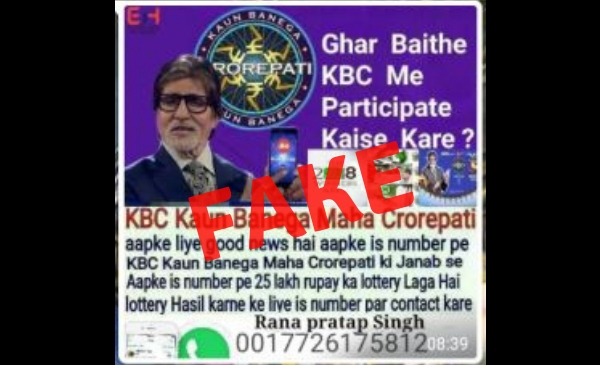 Earlier in March, The Times of India reported that a woman in Lucknow was duped of Rs 6,000 in the name of KBC lucky draw. Tempting her with two cash rewards of Rs 36,000 and Rs 17,500, the victim was asked to deposit Rs 6,000 by cheque which she did. Her husband, a city lawyer lodged an FIR with the Krishnanagar police. The modus operandi is a simple time tested method used by fraudsters in other such online scams in the past- Tempt the caller with cash reward and once the caller is hooked, seek a processing fee. Even if the caller is suspicious, the relatively low processing fee as compared to the reward tempts them to wire the fee into a bank account. Once that is done, the caller does not respond to any calls from the victim. Speaking to BOOM, Balsing Rajput, SP Cyber, Maharashtra confirmed that its a common method used by fraudsters to fool gullible citizens. Rajput said that while such calls can be made from any country, it is not uncommon to find local associates who transfer the money through a maze of bank accounts, sometimes taken on rent after paying a nominal fee to the original bank account holders. Those receiving these calls and messages should be careful not to fall for such scams. 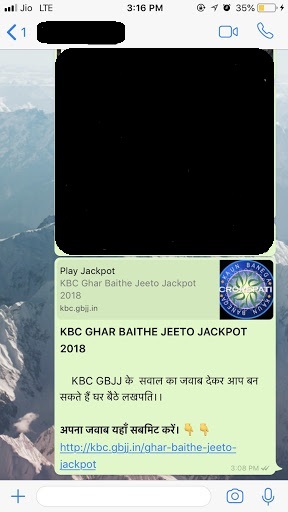 The message says, ” By answering question for KBC GBJJ, you can win lakhs of rupees. 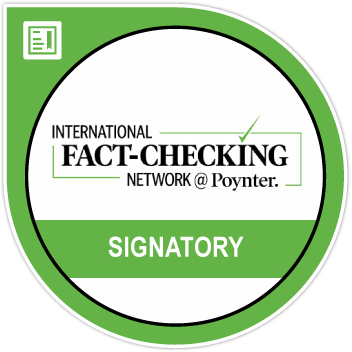 You can access the archived version of the website here. When we checked the website, we saw the branding of KBC and SONY Entertainment Television at the top of the website followed by the question for the day. The website also asks for the name and number of the participant. 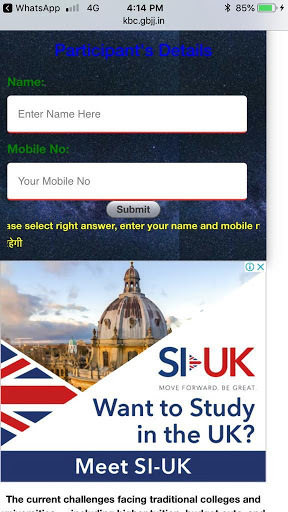 It also flashes an advertisement as seen below in the screenshot through which the creator of the website must be earning revenue, every time a user clicks on the link. 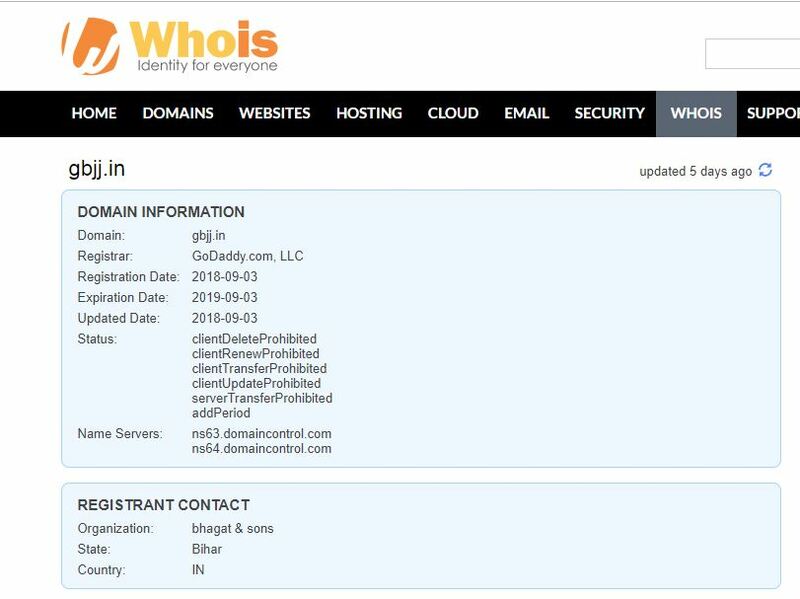 We checked the details of the website on Whois.com which shows that the website is registered under the name Bhagat & Sons from Bihar. The popular game show’s tenth season went on air on Sony from September 3 and will run between Monday to Friday at 9 pm. The show anchored by Amitabh Bachchan will run across 60 episodes as opposed to last year’s 52 episodes.